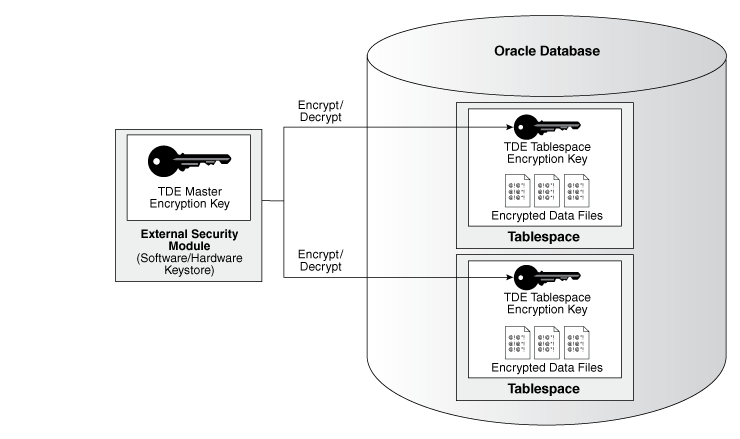 |__ o. TDE tablespace encryption uses the two-tiered, key-based architecture to transparently encrypt (and decrypt) tablespaces. The TDE master encryption key is stored in an external security module (software or hardware keystore). This TDE master encryption key is used to encrypt the TDE tablespace encryption key, which in turn is used to encrypt and decrypt data in the tablespace. |       |__ o. Adding parameter ENCRYPTION_WALLET_LOCATION within sqlnet.ora file. |__ o. Database must be in "READ WRITE" mode. |__ o. "WITH BACKUP" creates a backup of the keystore. You must use this option for password-based keystores. |      Optionally, you can use the USING clause to add a brief description of the backup.